Ghats in Banaras or Varanasi are riverfront steps leading to the banks of the River Gangas. The city has 88 ghats. Most of the ghats are bathing and puja ceremony ghats, while a few are used exclusively as cremation sites. Most Varanasi ghats were built after 1700 AD, when the city was part of Maratha Empire. The patrons of current ghats are Marathas, Shindes (Scindias), Holkars, Bhonsles, and Peshwes (Peshwas). Many ghats are associated with legends or mythologies while many ghats are privately owned. Morning boat ride on the Ganges across the ghats is a popular visitors attraction. 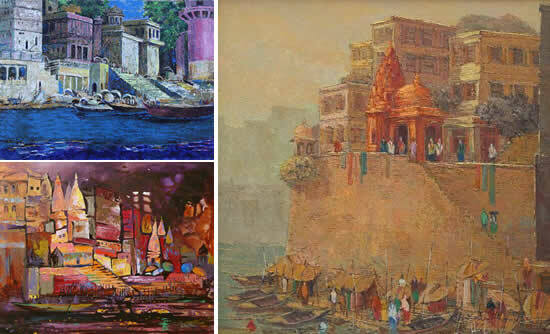 According to the puranic sources, there are five key ghats on the riverfront, important because of their association with a defining feature of the holy city of Kashi: Assi Ghat, Dashashwamedh Ghat, Manikarnika Ghat, Panchganga Ghat and Adi Keshav Ghat.